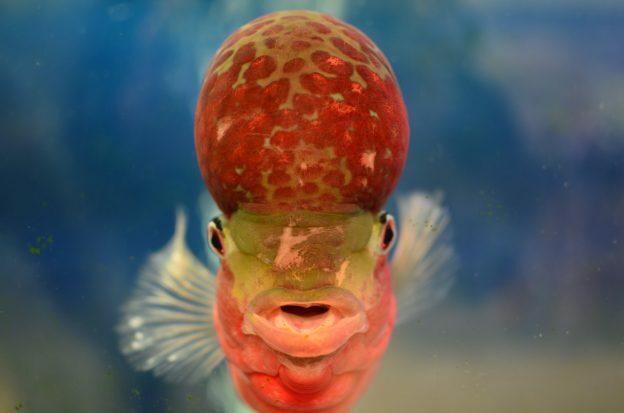 If you look at flowerhorn fish at just the right angle, it looks like they’re wearing elegant hats for a black-tie affair from a different era. The look rather suits them. You might also see a chef’s hat, so perhaps it’s its way of disguising itself as everyone’s favorite cook to keep from being eaten alive. Others think more of a flower with a beautiful round blossom on top. Yet others see a horn like you’d see on a child’s bicycle. 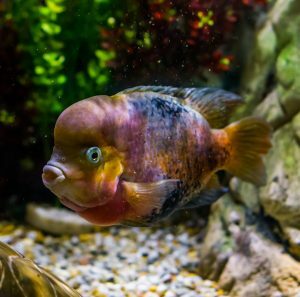 Any way you look at it, these cichlids are clearly some of the most unusual looking pet fish around. We would call its uniqueness beautiful, but we don’t want to give it a big head. Ah, sorry … we couldn’t resist one more bad dad joke. We’ll stop now and just tell you what you want to know about these bubbly fish. They’re not completely natural. They’re manmade hybrid fish. The cherry-like lump on their heads is called a nuchal hump. You can get one for a reasonable price of $10 or so, but some can be hundreds or thousands of dollars. Flowerhorn fish can be very aggressive, so they need their own tank. In fact, even plants can’t live with them. If you do add plants to the tank, make sure they’re minimal. Artificial plants may be a better option in this case, and man-made filters will help keep the tank clean. They grow to about 8 inches long. Keep the temperature in the tank at about 82 degrees. A neutral pH level of 7 is recommended. Common varieties are Golden Base, King Kong Parrots, Kamfa, IndoMalau, Zhen Zhu, and Thai Silk flowerhorn fish. While they hold the crown with hobbyists, other fish think they’re the pits. When released into the wild, some flowerhorns are considered invasive species to the native environments. Flowerhorn fish have only existed for about three decades. With proper TLC, they can live for about 11 years. Although they’re aggressive, they tend to have lively personalities. They may even bond with you once they get to know you. The nuchal hump regularly expands and shrinks. Also called a kok, the lump looks like a big brain, but it actually consists of fat and a gelatinous structure. Therefore, it can be damaged or torn easily, which may explain why they prefer to be alone. 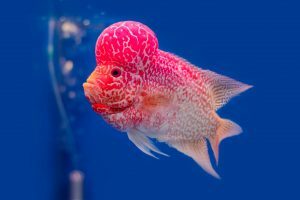 This entry was posted in Fish Facts and tagged Aquarium Living, Fish Facts, Flowerhorn Fish, Golden Base, Kamfa, King Kong Parrots, Nuchal Hump, Thai Silk on March 31, 2019 by admin. The betta fish is bad to the bone, and it knows it. With a personality four times its size and an unforgettable flair, the most popular betta fish are named Japanese fighting fish or Siamese fighting fish for a reason. They can be very aggressive, so much so that they need their own fish tank. The good news is that they don’t grow to much larger than 2 inches, so they won’t require a whole lot of space. But when someone first said looks can be deceiving, boy, they weren’t lying. 1. With their long, full, luxurious, glorious fins waving in the water around them, the Siamese fighting fish look like something between Rapunzel and a peacock. 3. Bettas have upturned mouths. They feed mostly on the surface of water. 4. It’s a myth that they can survive in a little fish bowl. They actually need a lot of space to swim freely. 5. Even though you might be able to get away with a small- to medium-sized tank, do change their water every few days. They don’t particularly like dirty water, and you don’t want to make them angry. You won’t like them when they’re angry. 6. Bettas need substantial foods, especially protein. Dried bloodworms and brine shrimp are good options. 7. The ideal water temperature for them is about 79 degrees. 8. It’s a labyrinth fish, which means it can breathe oxygen from the air as well as through its gills. It can therefore survive outside of the water longer than some other fish. In fact, it may be able to live on land for several hours as long as it stays wet. 9. Males and females are on equal ground in their underwater world. They’ll fight each other regardless of gender. 10. The pH level of their water should be about 6.5 to 7. 11. They generally live up to three years, but with tender loving care, they might live several years beyond that. 12. 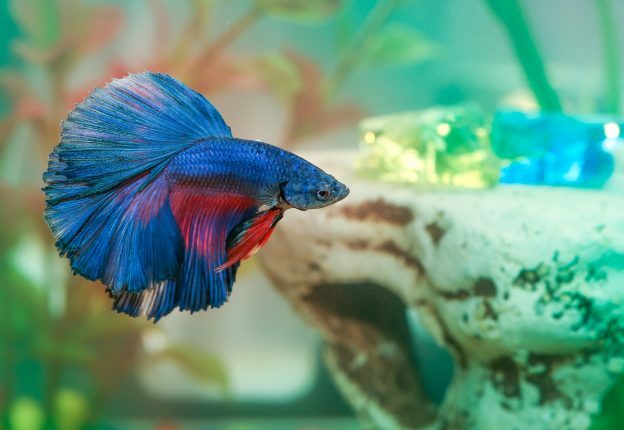 There are 70 different species of bettas, although most people think of the Siamese fighting fish/Japanese fighting fish in relation to betta fish. 13. Male bettas protect and raise the babies. 14. 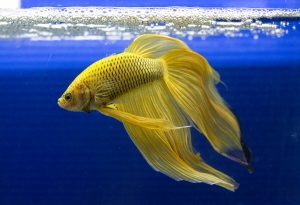 Different types of betta fish have different color patterns and tail shapes. Pet bettas can be found in virtually every color under the sun, and individual bettas and their fins can be multicolored. In the wild, their coloring may be paler. 15. Male bettas tend to be larger and more colorful than the females. 16. Bettas create bubble nests for mating purposes. 17. Female fighting fish are more likely to cohabitate than the male fish, so you don’t always have to keep them alone. Wanna Bet on a Betta? We at Seatech Aquariums love betta fish, and we bet you will too. If you’re interested in designing a fish tank for Siamese fighting fish or any other bettas, we’ll be here ready to help. 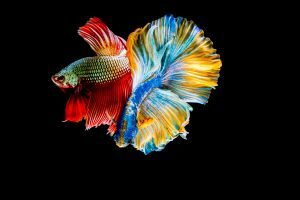 This entry was posted in Fish Facts and tagged Bettas, Fish Facts, Japanese Fighting Fish, Siamese Fighting Fish on February 24, 2019 by admin.